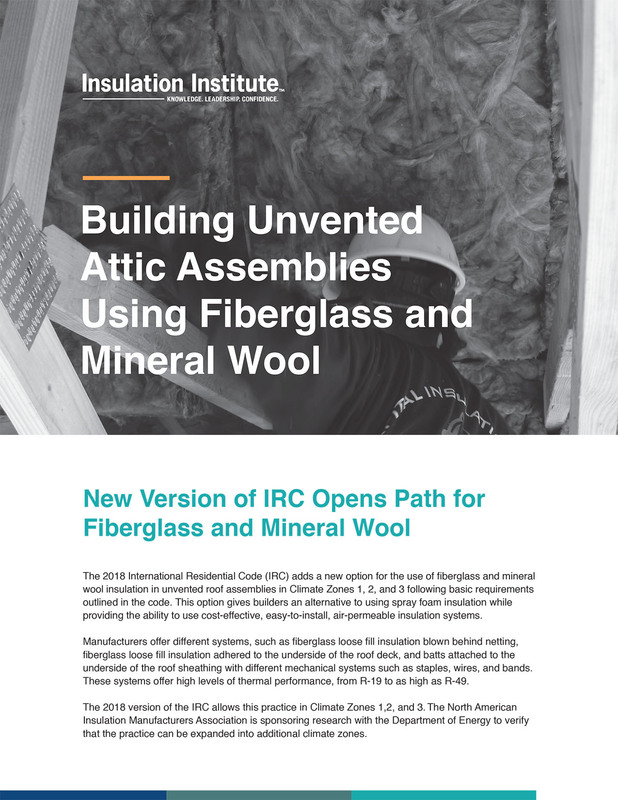 The 2018 IRC allows air-permeable fiberglass and mineral wool insulation in unvented attics in Climate Zones 1, 2, and 3. Our new guide details how to do this. Prior to the completion of research and publication of the 2018 IRC, concerns about condensation in warm, humid climates prevented the practice. However, research studies have shown that fiberglass and mineral wool can be used safely in these locations. This practice gives builders a proven, cost-effective, option as an alternative to open or closed cell spray foam insulation. It also allows contractors to work with familiar materials that require no special training and installation practices. Manufacturers offer a variety of systems, such as fiberglass loose fill insulation blown behind netting, fiberglass loose fill insulation adhered to the underside of the deck, and batts attached to the underside of the roof sheathing with different mechanical systems such as staples, wires, and bands. The thermal performance of these options ranges from R-19 to R-49. Research is underway to verify that fiberglass and mineral wool insulation can be used safely in unvented attic assemblies through Climate Zone 5. NAIMA is sponsoring research with the Department of Energy to verify if the practice can be expanded to additional climate zones. For details on the new option of building unvented attic assemblies using fiberglass and mineral wool insulation, click here for access to our technical brief. Want to read more blogs on high-performance best practices and insulation? Read the Insulation Institute blog page. A vapor diffusion port prevents air from moving into or out of the attic, but it does allow water vapor to leave the space. One way of building the port is to construct a standard roof or ridge vent but seal with a typical house wrap.